Good on yah Tim, you have earned a lot of respect and awe at trying (and almost succeeding at)something very very hard to accomplish. Respect. "Well folks I’m sad to say but the dream is over. Having spent weeks on shore waiting for the correct conditions to get around Cape Reinga, I finally admitted defeat this week and made the hard decision to return home yesterday morning via airplane. I know this may come as a bit of a shock to all of you have supported me throughout this whole expedition but it is not a decision that I came to lightly. Since arriving in Ahipara, at the base of 90mile Beach, I have been patiently waiting for a weather gap that would have allowed me to get up and around Cape Reinga. For those of you, who aren’t familiar with this area of NZ, just imagine a single stretch of beach that is roughly 85km long (it’s not 90miles like the name suggests). At the top are 3 different Capes to go around, including Cape Reinga which is where the Pacific Ocean and the Tasman Sea meet. Then it’s a 40km run, down the beaches on the East Coast, to the safety of Hohoura harbour. Now you might ask “what’s so hard about all off that, you’ve just done most of NZ”. The trouble with this area is that I’m switching between 2 coasts and 2 different water masses in a very short space of time and as a general rule, it’s fair to say that you don’t often get calm weather on both coasts at the same time i.e. if it’s calm on one coast, it will be rough on the other. Then there is Cape Reinga where the Tasman Sea and Pacific Ocean meet, aptly named ‘Meeting of the Waters’. This area can be an extremely violent place, with huge currents and both standing and breaking waves. There is not a single commercial skipper who does not treat this area respect this area because even in a big boat they know that it could destroy them in seconds if given the chance. So yeh, a real fun place in a kayak. Knowing all of these factors, I really did need a settled period of weather. Not only that but I needed less than 2m of swell on both coasts and unfortunately I just don’t believe that I will get these conditions until possibly next spring. On top of this I was extremely worried about my loss in fitness due to my enforced stay on land. Facing an area that is so extremely tough, I wanted to be at or near my peak or else I would just be asking for trouble. In the end I decided that this would be best achieved if I was at home where I have variety of training options and support. Trust me it wasn’t an easy decision to come to having already achieved so much, but I think it was the right decision in terms of safety and my own sanity. I would really like to thank everyone who has been involved in my expedition. There are literally thousands of you and I never felt like I was alone while out on the ocean. At the top of the list is my family, who have provided me with un-wavering support right from the beginning. Dealing with a moody athlete is often not easy but they are always there and for some reason they still love me haha. Then there are my friends, both local and abroad, who have also been behind me from the beginning. Simple things like quick txt message or a dodgy story from home were huge moral boosters and helped me to get through some tough times. There are my sponsors, who have faithfully supported me with both equipment and technical advice, not to mention many of them becoming extremely good friends. I back all of the gear and brands that I used simply because if I can’t break it, it must be good. There is everyone who I have met along the way. So many people invited me into their homes and their lives and offered me accommodation, a meal, or even just a cuppa and I have been completely humbled by people’s generosity. And finally there is everyone who I haven’t met. On a daily basis mum would read out messages of support that had come through my website and I can say that it truly blowed me away. There were literally thousands of messages from all over NZ and around the world so a huge thanks to all of you who offered encouragement, prayers, and continued inspiration. There is no way I’ll ever be able to pay you all back but I will never forget the generosity and support that I have received so far. From this point I really don’t know where things will be going. I have spent the past 18 months totally dedicated to this expedition and for once I don’t have all the answers. 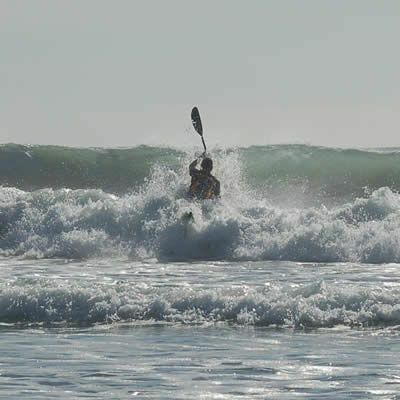 Practically all I know is kayaking and the ocean and I fear that may be a bit hard to adjust back to a normal life. Over the coming weeks I will be sitting down with friends, family, and sponsors to decide on future. Unfortunately I won’t be claiming any sort of record like I had hoped but there are many ways of doing things so I’ve just got to figure out a new one. Until then everyone, keep an eye on the website from time to time and I’ll let you know how things progress. " Read more of Tims Journey and his upcoming plans to finish of the coast here. June 9th, 2011 The protest camp at Waldaman near James Price Point is in positive and strong spirit. After holding up the bulldozer’s progress along the road for another five hours this morning thoughts are turning to the next efforts to protect Country and stop the pre-emptive land clearing. All the folks at the camp would like to thank everyone for all the support and the donations of food and supplies. Still there has been no land cleared by Bulldozer on country and all involved are determined that this will not happen. If you can get there tomorrow your presence will be very important. or look at what can I do to help and how to write a letter. Latest: 10:14 pm Goolaraboolo family and supporters are currently sitting in front of the bulldozer. They will not move. They expect more police at dawn to move the dozer. Please – lots of people early to support please – Day 3 tomorrow is shaping up as another big one..
5:32 pm 8th June 2011: Both Shane and Shayne have just been cut off the bulldozer and car respectively. For local hero Shane that represents one of the longer ‘lock ons’ in protest history. This is not the end of the story, no matter where you are – if you can get out there soon. The Country needs you. “Protesters and police camped on the site of the blockade last night and are expected to remain in the position about 15km from James Price Point into tonight. There was broad coverage of the unfolding events on evening TV news. Hero of the Country; Shane, locked on to the Bulldozer to halt it in its tracks! 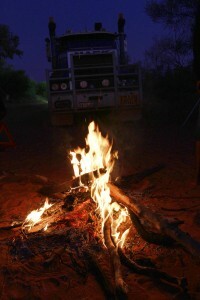 June 7th, protesters met Woodside contractors on the road to James Price Point north of Broome. A small group who got wind of the movement of bulldozers and other equipment formed a human chain across the road and delayed progress, and a protester chained himself to the bulldozer on it’s trailer. Meanwhile a small car with no wheels appeared on the road further down the track and a steady stream of Broome locals joined Joe and Phillip Roe and Therasa, who are Traditional Owners, native title claimants and Law Boss for the area, in protecting Country from planned clearing. A ‘back of the ute’ concert from Dave Mann and Will Thomas, juggling and singing accompanied the firm but non-violent protest message and strong cross-cultural community spirit as Greens MLC Robin Chapple and a diverse cross section of Broome business owners and residents supported the road blockade and bulldozer lock on. Woodside want to start clearing bush in the area they propose for a huge Gas plant. Protesters point out that this development is NOT APPROVED by the WA EPA, the WA environment Minister, the Federal Environment Minister, Woodside’s joint venture partners and not even at final investment decision point for Woodside itself. Compulsory acquisition of the land from the native title claimants is still on the table and is currently the subject of a legal challenge. This development is clearly not approved by the Broome community and they were there to show that and stop the pre-emptive clearing of bushland. THERE ARE ALTERNATIVES – gas could be processed offshore like Shell is doing or processed in the Pilbara where there is already established infrastructure. A port and plant at James Price Point would be environmentally and culturally damaging. this little car held up Woodside contractors all day..
"STOP" pleads Theresa Roe, mother of native title claimant Joseph Roe.